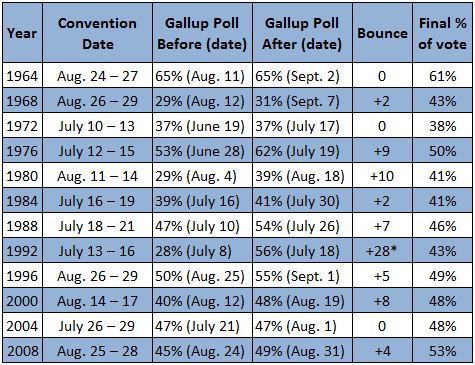 Larry J. Sabato's Crystal Ball » The Conventions: How Big a Bounce? The Conventions: How Big a Bounce? The conventions are upon us, and the Crystal Ball team will be reporting live from Tampa and Charlotte. Follow @larrysabato, @kkondik and @geoffreyvs on Twitter for commentary on the party pep rallies, and look for the Crystal Ball on Friday, Aug. 31, and Friday, Sept. 7, for our thoughts on the conventions. That means, for the next two weeks, the Crystal Ball will be published on Friday as opposed to our regular Thursday edition, so we can take the entire convention into account in our report. Basketballs have them, Tigger has them, and presidential candidates have them — at least most of the time. They are bounces, and for the respective major party nominees, the upticks in support typically show up in national horse race polling right after their party conventions. Once an actual mechanism for selecting a party’s presidential nominee, party conventions now serve as scripted infomercials for the parties and their candidates. The only drama comes in seeing whether one of the parties makes a major mistake or in trying to quantify the convention’s effect. Hence, we measure the bounce — if it occurs — and see if it lasts. 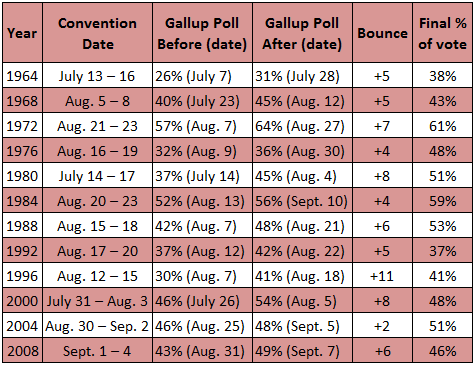 Charts 1 and 2 show the typical bounce that a candidate gets from a convention by comparing the Gallup poll of registered voters taken before the convention with the one taken afterward over the past half-century. Note: * indicates that Clinton’s 1992 bounce was inflated because it also reflected Ross Perot temporarily leaving the race. Bounces are normal but not universal. In all 12 cases, the GOP nominee got a bounce, and the same was true in nine of 12 conventions for the Democratic candidate. Why not all 12? Lyndon Johnson’s polling had already peaked in his landslide year of 1964, so it was hard for him to boost his soaring numbers. George McGovern’s disastrous convention in 1972, when internal disputes pushed his acceptance address into the wee hours on the East Coast, netted him a dead cat bounce. In 2004, John Kerry didn’t budge, at least in the Gallup Poll, from 47% — right around his proportion of the vote in November (48%). Kerry had a high floor, due to opposition to George W. Bush, and a low ceiling as well, owing to Bush’s strong base backing. Excluding Bill Clinton’s 1992 bounce due to extenuating circumstances (see below), the average size of a bounce has been 5.1% — higher for Republicans (5.9%) than Democrats (4.3%). Despite the averages, there is considerable variance in the size of the bounce from election year to election year. Bob Dole holds the mark for best bounce on the GOP side (11 percentage points in 1996). Bill Clinton grabbed the Democratic gold with a massive 28 percentage point burst in 1992, but this was due primarily to Ross Perot’s decision to abandon his independent bid at about the time of the Democratic convention. Perot’s exit consolidated the anti-George H.W. Bush vote under Clinton, but the mercurial Perot reentered the contest in early October 1992 and pulled a remarkable 19% in the actual election. Bounces oftentimes fade by Election Day. Jimmy Carter slid from 62% after his convention to 50% on Election Day 1976; Michael Dukakis from 54% to 46% in 1988; and Bill Clinton from 56% to 43% in 1992. Meanwhile, George W. Bush lost six points from the end of the convention to Election Day in 2000, and John McCain lost three points. If this election is truly shaping up to be a repeat of 2004 — a battle of bases between George W. Bush and John Kerry — then perhaps we won’t see much of a bounce for either candidate. As noted above, Kerry got no bounce, and Bush’s was only two percentage points. However, the RealClearPolitics average of national polls from 2004, of which Gallup is but a subset, shows that Bush built a lead after the convention that he never relinquished. The actual standings of the candidates after both conventions are sometimes amazingly predictive of the November results, and at other times are terribly misleading. So wouldn’t you know it? We just can’t rely on bounces to tell us much beyond whether the electorate is “dug in” and resistant to switching sides. In 11 of the 24 presidential candidacies since 1964 noted in the charts above, candidates finished within three percentage points of their post-convention polling. Statistically, this makes the bounce meaningless in a predictive sense, because about the same number of candidates’ standings did change significantly from the end of their convention to November. The American people already know Barack Obama well, and their opinions of him are relatively set: Obama’s approval rating this year, based on the RealClearPolitics average, has never dipped below 44.5%, nor has it exceeded 49.2%. His head-to-head polling average versus Romney has also been highly durable. Granted, Romney’s performance against Obama has been just as consistent, but given that Obama is in a considerably weaker position now than he was in his race against John McCain four years ago, Romney’s numbers probably have more room to grow. So we’re going to watch whether Romney gets a bounce after next week’s Republican convention — and, if he does, whether he keeps it. While not an air-tight predictor, this will be the first general election indicator of Romney’s likely fate — and Obama’s too.